As a part of its outreach to Asia, Russia has periodically held joint stamp issues with many countries in the continent. The stamps, mainly dedicated to the establishment of diplomatic relations, feature natural and historical landmarks. The establishment of the diplomatic ties between Russia and Laos dates back to October 1960. In November 2015, the two countries released an issue dedicated to the 55th anniversary of the establishment of diplomatic relations. They chose images of well-known architectural monuments to illustrate the stamps – the 12th-century Church of the Intercession on the Nerl River, and the That Luang Buddhist temple complex. In August 2014, Russia and Mongolia issued a lozenge-shaped stamp to celebrate the 75th anniversary of the joint victory of Soviet and Mongolian troops over Japanese aggressors at Khalkhin-Gol in 1939. The Battles of Khalkhin Gol (also known as Nomonhan Incident) were part of the undeclared border conflict between the USSR and Mongolia on one side and Imperial Japan and its puppet state of Manchukuo on another. On May 11, 1939, craving to feed their horses, a Mongolian cavalry crossed the Khalkhin Gol River near the village of Nomonhan and entered the disputed area, which was a Manchurian-claimed territory. During the next three months Japanese, Manchukuo, Mongolian and Soviet forces fought a “hidden war” at Khalhin Gol. The final battle took place in Aug. 1939, and ended with a complete defeat of the Japanese-led forces. North Korea and Russia agreed to make 2015 a “year of friendship” to mark the 70th anniversary of two major events - North Korea’s liberation from Japanese occupation and the Soviet victory in World War II. The stamps show the flags of both countries. Later in 2015, Russia and North Korea issued a stamp that features the second tallest triumphal arch in the world, the Arch of Triumph (standing 60 m high and 50 m wide), which was built to commemorate the Korean resistance against Japan from 1925 to 1945. 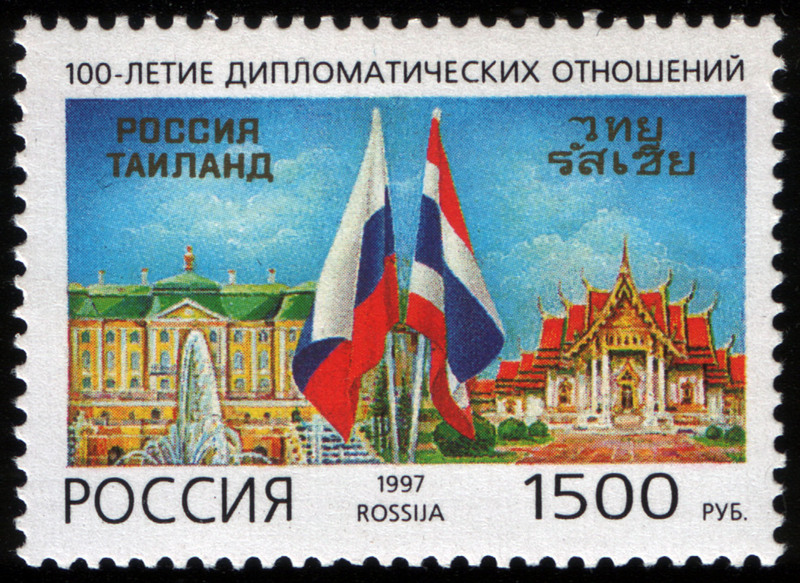 In July 1997, Russia and Thailand issued two stamps to celebrate the 100th jubilee of the establishment of diplomatic relations. The first stamp shows the flags of both countries, while the second one is dedicated to the first visit of King Rama V to Russia in 1897. The stamp features the summer residence of the Russian emperors, the Peterhof Palace, where the Thai king spent his first days in Russia. Earlier this year Russia and Thailand announced plans to issue a stamp to mark the 120th anniversary of the establishment of diplomatic relations between the countries on June 2017. In 1990, Vietnam celebrated the 100th birth anniversary of Ho Chi Minh and the 60th anniversary of the foundation of the Vietnamese Communist Party. Regarded as a father figure in Vietnam, Ho Chi Minh lived several years in Russia before he led Vietnam’s war effort against the United States. Marking these anniversaries with great pomp and splendor, Vietnam and the USSR released two collections of stamps, designed by Soviet artists. The USSR-Australia collection represents neither friendship nor the establishment of diplomatic relations, but shows the scientific cooperation between two countries. On June 13, 1990, the USSR and Australia released a stamp collection highlighting joint scientific research in the Antarctic. The stamps were illustrated by Soviet artist Yury Artsimenev and Australian graphic designer Janet Boschen. Scientific research in Antarctic: flora and fauna. June 13, 1990. Source: rusmarka. The India-USSR stamp collection illustrates the friendship between the people of the two countries. The stamps feature the drawings of 11-year old Tonya Vorontsova from Moldova and Sanjay Adhikari from India. Vorontsova drew images of Indian people, while Adhikari illustrated the Red Square. The stamps were released on Aug. 8, 1990. On May 18, 1999, China and Russia released a stamp collection, which depicted red deer in both countries. Red deer, also known as wapiti, are found in Europe, southeastern Siberia, northeastern Mongolia, North Korea, North America and North Africa. In China, they live in Inner Mongolia, Sichuan province and Tibet. Red deer are also listed as protected animals worldwide.